The Dictionary describes "VariMax®" is a mathematical process to develop maximum performance. In our industry super stable VariMax® HS:320 liquid foaming concentrate is a product which is turning the world of foamed, cellular concretes upside down by offering variable dilution ratios, substantial cost savings and maximum foamed concrete performance. VariMax® HS:320 offers up to eight times the dilution ratios of competitive products, cost savings and maximum performance to boot. Hold onto your hardhat, VariMax® HS:320 Variable Hyper Dilution Ratios for cellular concrete has arrived on the USA market. The VariMax® family of liquid foam concentrates offers the cellular concrete industry a long overdue technological advance in foam generation. The core ingredients in VariMax® HS: 320 liquid foaming concentrate are a proven time tested formula. 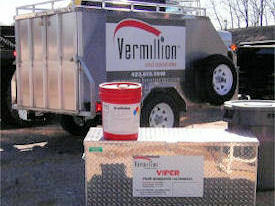 Vermillion LLC and Associates has made unique formulations to the VariMax® product, not changes in the core formula, but changes in how it is packaged and presented. In short, we are leaving out the "excess water" that customers of old pre-diluted 1:40 foaming agents have been paying dearly for these past 40 years. You do not need to buy additional water inside the container of your liquid foaming concentrate. We do not sell you excess water; just the world's best, most concentrated ASTM classified liquid foam concentrate. The old 1:40, watered down, hustle has been exposed. VariMax® liquid foam concentrates offer a variable high dilution ratio formulated to match your cellular concrete application. Our VariMax®, mixing ratio is a guideline. With VariMax® you decide what ratio to mix your concentrate. VariMax HS: 320 is not pre-diluted with excess water. VariMax® HS: 320 meets or exceeds all ASTM C 869 Specifications when tested according to ASTM C 796. Complete independent Laboratory ASTM Test results are available for VariMax® HS: 320 concentrate. We suggest you always demand documented Independent ASTM C 796 and C 869 Test results from the supplier of any foaming agent.